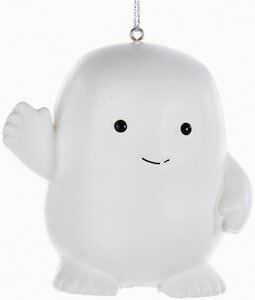 If you want Doctor Who details in your Christmas tree then come check out this Adipose Christmas ornament. The ornament is perfect in a Christmas tree as it is white and that works great on a nice green Christmas tree. The Adipose ornament looks just like the fun looking Doctor Who creature and it is waving at you but still, shows his tooth. And as the Adipose is not really Christmas decorated you can use the ornament the whole year long just hang it on your ceiling or maybe in your locker at school or work. 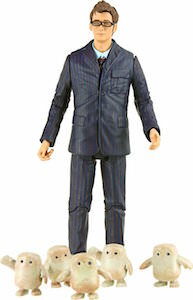 Christmas stockings don’t have to be red, green or shaped like most are and this Doctor Who stocking proves that. This Christmas stocking is shaped like and Adipose and we all kind of like this fat eating creature and that makes it perfect as Christmas decoration and I am sure it’s just as good as a normal shaped stocking at holding Christmas presents. 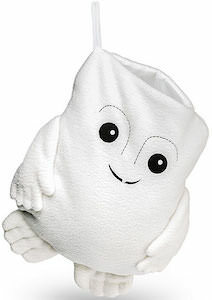 The Adipose stocking is white and has the face of the creature on it and his arms, hands, and feet are there too so that it looks just like a real Adipose. This Doctor Who Christmas stocking is 19 inches long and just a great addition to your Christmas decorations this holiday season. String lights are great for in the Christmas tree but this set of Adipose lights are great for year long use by a true Doctor Who fan. The sting light has 10 Adipose lights and is great for indoor or outdoor use. Just imagine having the fat eating creatures in your Christmas tree it will be so much fun. Also just having a string on your bedroom wall will make your room looks more cosy because of these cute lights. Of course you have to like Doctor Who to really enjoy these fun Christmas lights. 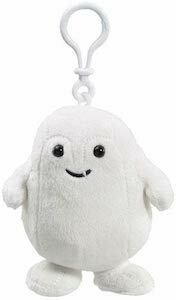 If you would like an Adipose then maybe this key chain is the safest way to go. The Pocket Pop! key chain is 1 1/2 inch tall and looks like a real Adipose but isn’t so no worries you fats are safe. A cute key chain like this is great for hanging out with your keys but also as decorations on a backpack or maybe even as a zipper pul on your jacket. 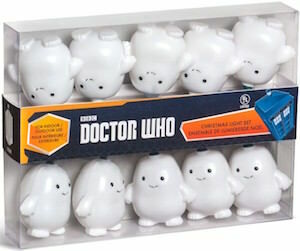 And the Adipose key chain also comes in a nice windowed box in witch you could leave it and just display it like that. Adipose the solution for loosing weight that works guaranteed but may not be so safe for humans. Now you can own a little fat guzzling Adipose for yourself but you are in luck this one is not alive just amazingly cute. This figurine of an Adipose is about 3 3/4 inch tall and comes in it’s own little display box so that you can display it with or without the packaging. 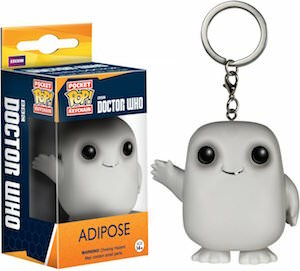 Of course any true Doctor Who fan would love to own a Adipose and this is the one to get as it will not eat all your fat. 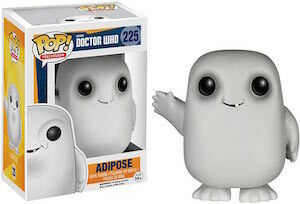 Come check out this Doctor Who Adipose Pop! Vinyl Figurine. This pinback button is great for Doctor Who fans that love those funny white Adipose creatures. This Doctor Who button is 2.25 inch in diameter ad on it it says “Try Adipose The fat just walks away!” and that is literally what will happen if you try them. The cute white creatures will feast on your fat till it is big enough to move out leaving you a hollow shell of a body. It may not be the ideal way of loosing weight but it sure is a great Doctor Who story that just makes you love those cute Adipose. Now is the perfect time to find the perfect spot for you Doctor Who Try Adipose Button. A true fan of Doctor Who, of course remembers that famous episode with the 10th Doctor and the Adipose. Even though it may not be too healthy to have some of those creatures living in your body it can help with disappearing fat. 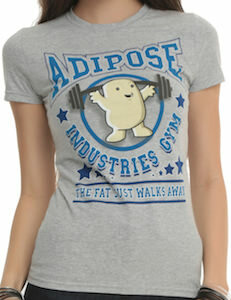 On this women’s t-shirt yo can see the text “Adipose Industries Gym, The fat just walks away” and in the middle, you can see an adorable Adipose holding up some weights. You can get this adorable gray Adipose t-shirt in many women’s junior sizes going from XSmall – 3XL. How do you store you coins? This Doctor Who coin purse is just perfect for storing you coins and even your paper money. The coin purse is white just like and Adipose and it even looks like an Adipose. Lets just hope the Adipose doesn’t think your money is yummy fat. A coin purse that looks like the cute Adipose is of course something every Doctor Who fan wants and now you can have one. 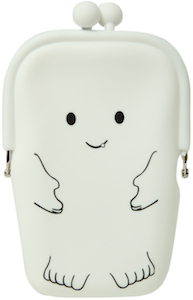 Not only is great for storing money it is also just cute to have your own personal Adipose. Collect all your spare coins and come get your Doctor Who Adipose Coin Purse.